Indian Motorcycle, America’s first motorcycle company founded in 1901, today announced its 2019 Chief, Springfield and Roadmaster models with new technology designed to enhance and customize the riding experience. Dark Horse models also get darker with premium gloss black finishes and expanded color options on Springfield Dark Horse. Riders can now choose between three Ride Modes on the fly – Tour, Standard or Sport – for a ride experience that’s customized to their riding style. The throttle map for each Ride Mode was designed with a specific application in mind, resulting in one motorcycle with three distinct personalities. “Tour” mode features a smooth throttle response for relaxed cruising. “Standard” mode features a crisp throttle response and well-balanced power delivery for responsive passing power and predictable, slow-speed handling. And finally, “Sport” mode features an instant throttle response and aggressive power delivery for head-snapping acceleration. To increase rider comfort, all Thunder Stroke 111 models are now equipped with Rear Cylinder Deactivation. When the engine reaches operating temperature and the ambient temperature exceeds 59⁰ F, the rear cylinder will automatically deactivate when the bike is at a standstill, resulting in less engine heat for improved comfort in slow-moving or stopped traffic. The rear cylinder instantly reactivates when throttle is applied for a seamless transition to full power. The lower fairings on the 2019 Roadmaster have been redesigned and optimized to provide significantly more airflow to the rider. This greatly improves comfort while cruising down the road. The redesigned airflow vent can be adjusted from all the way open for maximum airflow to fully closed for total weather protection. The new lowers can be retrofit to bikes from past model years with the addition of new highway bars. Several enhancements have been made to Indian Motorcycle’s stock audio system to significantly improve sound quality. First, the tweeters have been separated from the mid-range speakers to optimize sound output and clarity. Second, a dynamic equalizer that’s fully customizable now adjusts specific frequencies at different vehicle speeds to provide peak system performance at all times. As speed increases, the equalizer automatically adjusts each frequency to the optimal level to compensate for road, wind and engine noise. The result is crystal clear, 100-watt premium audio at all speeds. “These enhancements for 2019 showcase our commitment to listening to riders and continuously improving their experience with our products,” said Steve Menneto, President, Indian Motorcycle. “We are laser-focused on delivering a best-in-class riding experience, and these new technologies represent a focus on quality that will continue long into the future of Indian Motorcycle. Also for 2019, Chief Dark Horse and Springfield Dark Horse receive several style updates that further accentuate their mean, custom styling. 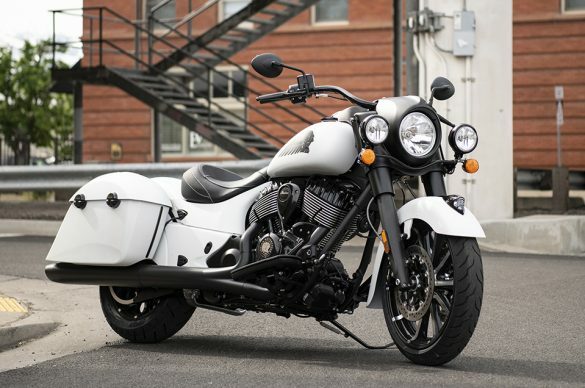 These models now boast premium gloss black finishes on the engine including the primary, valve, and cam covers, push-rod tubes, as well as on the exhaust and saddlebag hinges. Springfield Dark Horse is now offered in two colors –Thunder Black Smoke and a new White Smoke option [lead image!]. Also, notable for the 2019 Springfield Dark Horse is the addition of the iconic Indian headdress on the front fender and a 19” contrast-cut wheel. The front highway bars and windshield were also removed to punctuate its sleek, streamlined stance.